The Lady Bears traveled to Schultz tonight to open up their volleyball season! They arrived with intensity and excitement and left with a SWEEP!!! The 7th Grade B team won with scores of 25-14 and 25-13. Madison Saldana lead the team in aces behind the serving line and Cassie Cleveland worked hard to give her team precise passes. Michele Salas gave numerous contributing points as she dominated in every rotation. This team showed heart and spirit as they walked away with their first ever BBJH WIN! The 7th Grade A team won 25-10 and 25-8. Chloe Richards and Ally Gentry ran a great offense as they fed sets to the hitters, like Allie Ebbeler who gave a crowd roaring kill during the first game. Richards also led the team in serving aces followed by Gentry. The aggressiveness behind the serving line really set the tone for the match! Hadley Kelly's all around performance also helped seal this WIN and made it tough for Schultz to come back in the the final game. The 8th grade crew also did NOT disappoint starting with B team winning in two with scores of 25-9 and 25-16. Delaney Sebesta and Aurora Flynn dominated behind the serving line giving their team numerous points in aces. Sebesta with help from Kailee Aznar ran the offense by setting ball after ball to Izzy Luscombe as she put kills away. Madison Holder and Tylar South did an outstanding job in the back court making it hard for Schultz to score. Their hard work paid off tonight as they worked as a team to get the job done! 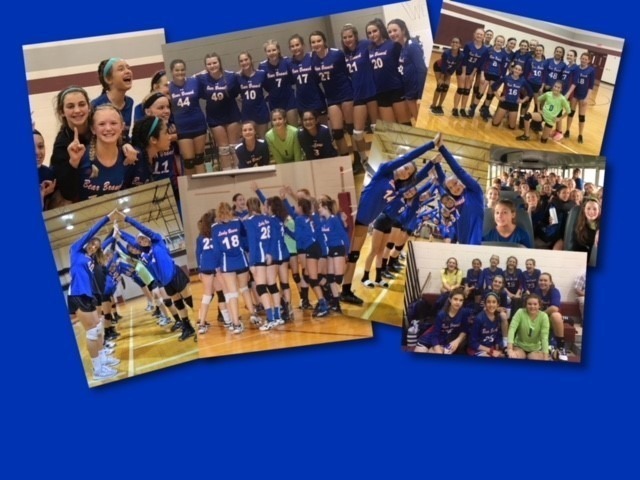 The 8th grade A team also won in two games with scores of 25-17 and 25-8. Mallory Madison and Ava Anderson led the team in ace serves while Sydney Holland led the team in passes and digs with assistance from Emma Bullock and Angelina Postel in serve receive. Madison, Addison Roden, and Whitney Harper ran a stellar offense as they distributed sets to Britney Albers, Madeline Ellis, Cheyenne Vaughn, Briley Smith, Carley Welch, and Anderson who all contributed to offensive points in the game. This WAS such a great team effort which made it hard for Schultz to score in game 2.